The State Soldiers and Sailors Monument, a focal point and symbol of the city, is a remarkable sculptural group and creates a dramatic civic space. The quality of its sculpture, bronze work, and concept is unparalleled in the state. Indiana made critical contributions to the Union cause with rich and poor volunteers from the farm and city and with funds from private and public sources. When the war ended, leaders wished to impress everyone who came to the capital with the weight of this sacrifice. After Indiana’s Civil War Governor Oliver Morton first recommended the idea, the Indiana General Assembly created a commission in 1887 to build a monument on the circle laid out in Alexander Ralston’s 1821 master plan and originally designated as the site of a governor’s house. The 1887 proposal for a permanent monument on the circle to Indiana’s fallen Civil War heroes added a dramatic new element to Ralston’s old plan. In 1888, the state held an international competition for the monument and selected German architect Bruno Schmitz as the designer. Schmitz had an excellent reputation in Germany but had never worked in the United States. Indiana was accustomed to taking artistic leads from Germans, who seemed to be involved in performing and visual arts in many Hoosier towns. For the winning design, Schmitz offered a remarkable Victorian confection, part Egyptian obelisk, part Romantic-era sculpture, part Neo-Baroque with cascading fountains and theatrical, stage-like groupings. Quarries in Owen County, Indiana provided the limestone. Approximately 285 feet high and encompassing essentially an entire city block, the monument became the largest Civil War memorial. The shaft of the monument was completed in 1892. In 1893, George Brewster won competitions for his bronze designs for the date band (or astragal) at the top; for the Navy astragal, based on the bow of USS Hartford; and for the crowning figure, Victory. Schmidt had originally conceived of "a winged victory" based on the mythological Nike figure for the top, but engineers were concerned about the wings in the wind. 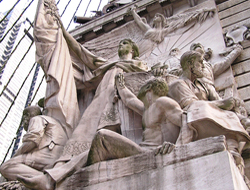 Workers installed Victory in 1893. German artisan Nicholas Geiger won another competition for the Army astragal installed in 1895. Rudolf Schwarz completed the rest of the sculptural program by carving the mammoth War and Peace groupings on the east and west sides of the monument and the Dying Soldier and Return Home groups in front of each on the upper terrace. Schwarz also sculpted the freestanding soldiers representing various types of military service: Navy crewman, artillery crew, infantry, scout, cavalry. Schwarz would base a new career in Indiana on designing monuments and memorials for courthouse squares and cemeteries. The War and Peace groupings are full of symbolism and detail, beginning with their placement – War facing east toward the beginning of the day and Peace facing the sunset at the end of the day. The Peace grouping provides some insight into the issues post-Civil War America faced. At the lower right, a slave raises his shattered chains and begins to rise. Next to him, a blacksmith with anvil rolls up his sleeves, as he looks to the south. The War grouping utilizes several traditional forms of sculpture including bas relief, high relief, and freestanding figures. The monument was dedicated in 1902. In the 1980s and 90s, the State of Indiana restored the monument including cleaning the stonework and bronze pieces. 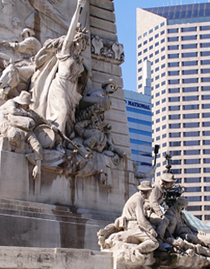 The State Soldiers and Sailors Monument is in the center of downtown on Monument Circle. The Colonel Eli Lilly Civil War Museum on the interior of the monument is open 10:00 am to 6:00pm Wednesday-Sunday. Call 317-232-7615 for more information. For a breathtaking view of downtown, take the elevator ride most of the way, and walk the last leg of the trip to the top of the monument. The monument has been recorded by the National Park Service's Historic American Buildings Survey.